So I am not going to lie… after redoing the Living Room the additional leftover furniture from that space led to explosion of room refreshes. I choose the pieces I really wanted to keep & MADE room for them. Even if that meant revamping a few spaces & pieces along the way. Sorry babe. Knowing I had to keep the console/desk we made last year, I decided to turn my nightstand into a vanity area. After some shoving & pushing (& a new coat of glossy white paint) the desk fits like a glove! But what good is a desk without a chair?! And the Ghost Chair was the perfect answer. AllModern asked me if I could help them with their #MyModern campaign & explain what my modern really is! My modern is bringing new life to traditional items & spaces. 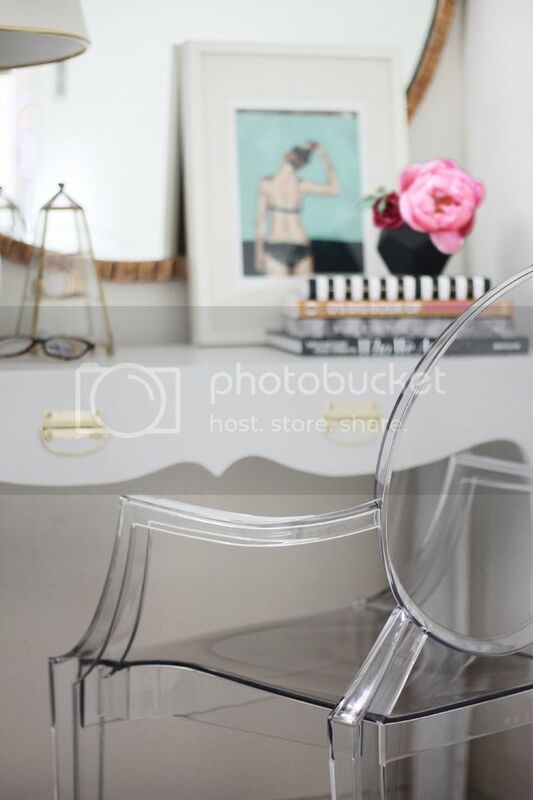 I have always loved the classic lines of the Ghost Chair with the modern use of acrylic. It melds seamlessly into virtually any space & design style. 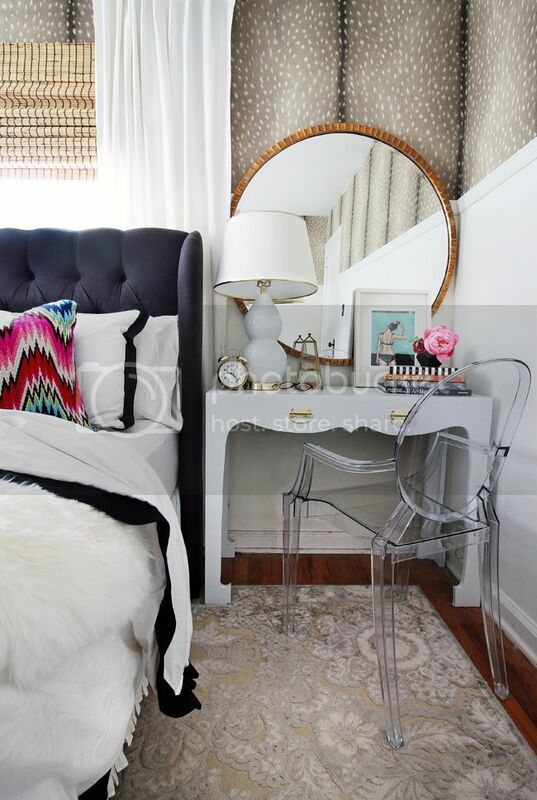 I think it works well paired with our traditional black linen tufted headboard & crisp white desk. It stands out in the room, while still simply becoming a part of the space & not taking up a real visual footprint. A great bonus in a smaller space like ours. AllModern is a great source when you are looking to add a modern touch to any space & making your own modern, whatever that is to you. They carry the iconic modern brands, as well as new up & comers. I’m shairing what #MyModern is on Social Media today & would love to see yours too! Simply use the #MyModern hashtag when sharing to see how others describe their modern. I’ll be talking all about our bedroom next week with details on everything! Wallpaper, our new mint condition vintage dresser & artwork. So stay tuned! I always love using a writing desk as a night table. It always adds such a feminine touch to "her" side of the bed. Yours is lovely. love love love it all – can't wait to see more!! it looks amazing! and i am drooling over that paper. Really pretty, Kristin. I'm in love with that colorful pillow! Gah! That wallpaper! I salivate every time I see it! What a gorgeous space! I love how the print is so different on the walls and that its only a portion of the wall. Where is that mirror from? I'm in love with it! Ive been dying to get my hands on some ghost chairs for my small dining room. I love the remix of such a classic design and that they take up practically no visual space. I love that your nightstand works double duty. Such a perfect small space living solution. It looks beautiful. YEP. that faun wallpaper is BANANAS! Beautiful room, as always! 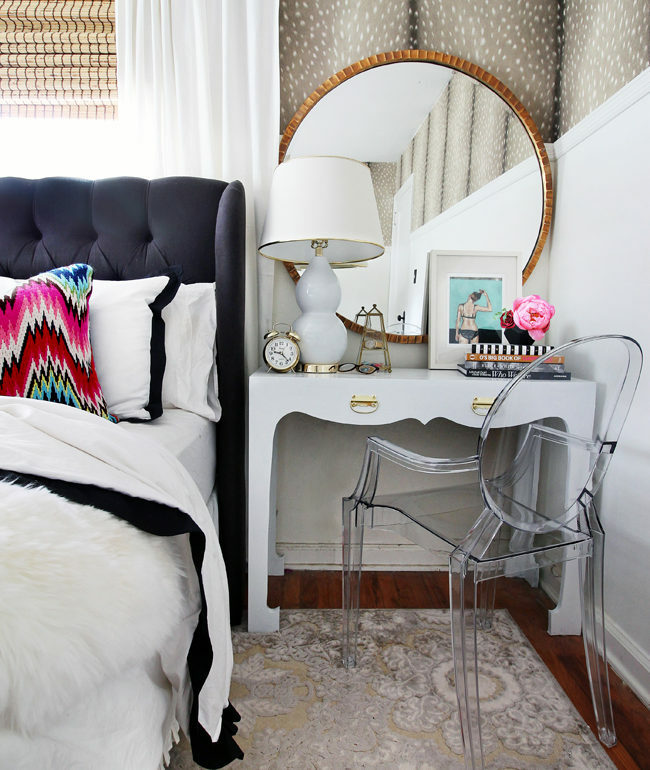 The Jonathan Adler Worth Avenue pillow is one of my faves. I did a very similar one in my guest room, as I needed a less expensive alternative at the time, but hope to soon upgrade to this one! More, more! We need to see more ~ 🙂 Just gorgeous, as usual! I love this! I'm actually taking a small table and putting it next to my bed in place of the traditional night stand. I hope it turns out the way I'm envisioning! I am also in love with that wallpaper and the mirror! Where is the rug from??! I LOVE it! Where is your bedding from?? I love it! Kristin- seriously AH-MAZING!!! The colors, the walls, I mean ALL of it! What a beautiful re-vamp! I especially like the wall paper, the color and the pattern is so elegant yet still fun. wow, absolutely love this idea!!! This is lovely! 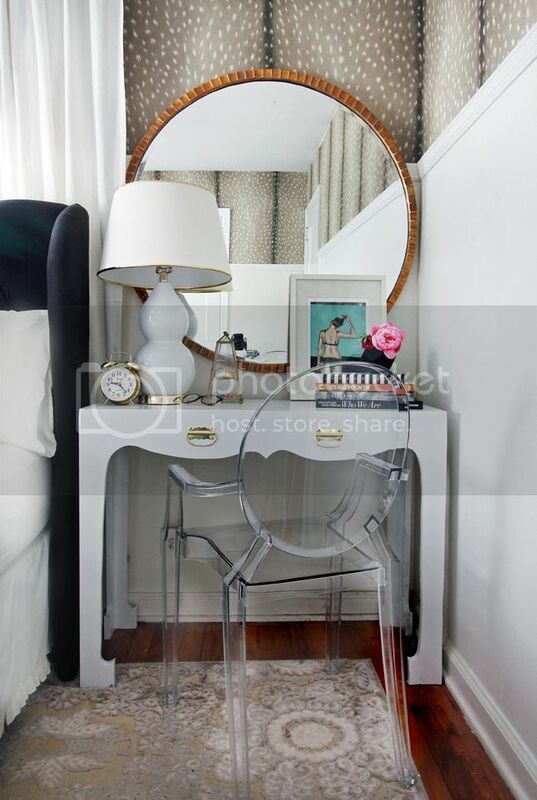 I am a ghost chair fanatic myself, and I think it looks beautiful with the vanity. I love everything about this! That bed looks sooo cozy! I love the mix of textures.